Welcome to CluePics Answers! If you are looking for answers to every level, you've come to the right place. Clue Pics is a great puzzle game by APPDREAMZ that is actually the sequel to What's The Saying. Each puzzle is tidbit of pop culture, hidden in a puzzle. 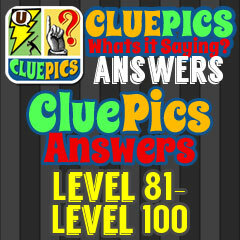 Your job is solve the puzzles and key in the answers using the letters that are given to you. If you get sidetracked and need to get back in the groove, search our site for the level that has you stuck and get your momentum back. CluePics has new levels new levels regularly. As soon as they're released, we'll get them up on the site, so check back regularly.